For this month's "Maps Of The Month" featurette, I wish to draw your attention to King-Hyrule's M.C. Kids (NES) maps. When Ronald McDonald's Magic Bag has been stolen by Hamburglar, it's up to Mick and Mack to travel across all of McDonaldLand to recover it! Along the way you'll meet other classic McDonald's mascots like Birdie, Grimace, the Professor, and (even the short-lived) CosMc before making it to Hamburglar's Hideout. You'll have to collect a bunch of cards as well as the iconic "Golden Arches" in this platforming adventure on your NES. While M.C. Kids is obviously promoting McDonald's restaurants, you can't really write it off just because of that. If you were to play the game, it's actually...not bad. Surprisingly not bad at all. It's actually a decent game, perhaps more challenging than you would expect considering its intended target audience. I'm not saying it's the greatest NES game ever, but if you want to play an 8-bit platformer with someone other than Mario or Mega Man, you could consider taking Mick and Mack on this adventure. Sure, it's easy enough to simply blaze through most levels, but eventually to progress you'll need to find enough cards, so you may find yourself revisiting levels to collect them all. Tricky jumps are a staple of platforming games, but you will also have to deal with things like reversed gravity, and fairly early on, even. Will you be able to make it to the hidden PuzzLeWoRlD? Thanks to King-Hyrule, you might have a chance! So to acknowledge the effort put into mapping this surprisingly good NES platformer, King-Hyrule's M.C. 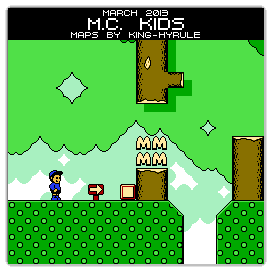 Kids (NES) maps will be known as VGMaps.com's Maps Of The Month for March 2013.